LISTEN: Two Mandela Speeches That Made History : The Two-Way There are two speeches delivered by the late Nelson Mandela that changed the course of history and cemented his legacy as one of the most revered leaders of our time. South African National Congress President Nelson Mandela delivers an address in 1990. There were two speeches Nelson Mandela delivered that changed the course of history and cemented his legacy as one of the most revered leaders of our time. As The New York Times explains it, Mandela along with other members of the South African National Congress (ANC) decided to admit they tried to bring down the regime, but while doing so, they would also put on trial the systematic racism put in place by the white regime. 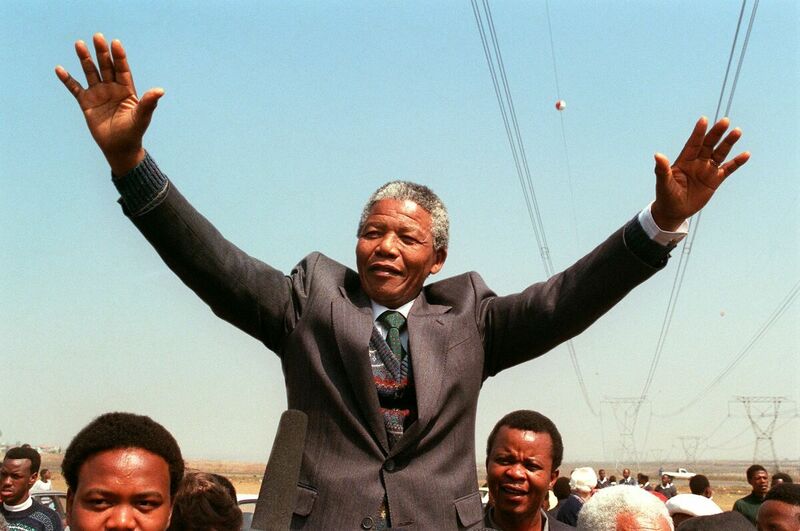 During the nearly four-hour speech to open the trial that would see him sentenced to 27 years in prison, Mandela laid out the plight of blacks in South Africa. But he also spoke of how blacks and whites had shared dreams. The Times quotes Mandela's biographer as saying that the speech — "the most eloquent of his life" — established Mandela not just as a leader of the ANC, but as the leader of the "international movement against apartheid." The lack of human dignity experienced by Africans is the direct result of the policy of white supremacy. White supremacy implies black inferiority. Legislation designed to preserve white supremacy entrenches this notion. Menial tasks in South Africa are invariably performed by Africans. When anything has to be carried or cleaned the white man will look around for an African to do it for him, whether the African is employed by him or not. Because of this sort of attitude, whites tend to regard Africans as a separate breed. They do not look upon them as people with families of their own; they do not realise that we have emotions — that we fall in love like white people do; that we want to be with their wives and children like white people want to be with theirs; that we want to earn money, enough money to support our families properly, to feed and clothe them and send them to school. And what 'house-boy' or 'garden-boy' or labourer can ever hope to do this? As we know, Mandela did make it out of Robben Island. Remarkably, he went from being an accused terrorist to leading the country through its first free elections and becoming its first black president. In 1994, he delivered his inaugural address, and instead of launching accusations at the white regime that had incarcerated him and oppressed his people for hundreds of years, he preached reconciliation. "The time for the healing of the wounds has come," he said. "The moment to bridge the chasms that divide us has come. The time to build is upon us." "Let freedom reign. God bless Africa."